For those new to live poker: Explaining absent, reserved, missed blinds, and seat change buttons. 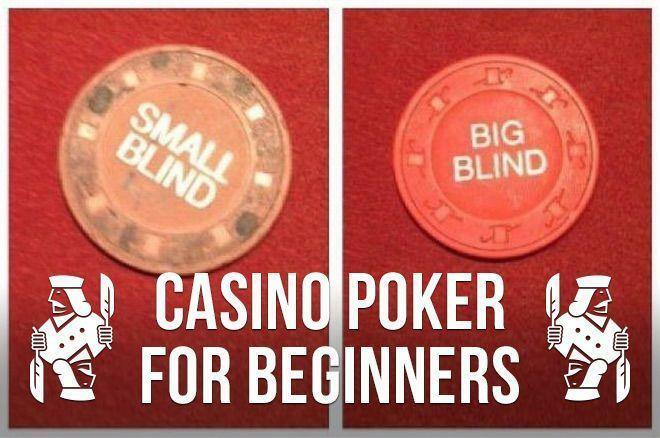 More button talk in the latest "Casino Poker for Beginners," incl. missed blinds, seat change & more. In my last article, I tried to lay out everything players new to live poker might ever want to know about the dealer button. Now let's move on to some of the other buttons you might see on a casino poker table, some of which even those who have played a lot of live poker might have questions about. The "absent" button gets used in a couple of different ways, depending on the casino. 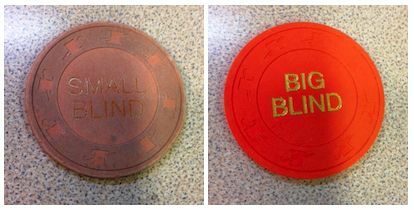 Most commonly, it designates a seat that is being held for a player who has lost all of his or her chips, but has indicated a desire to keep playing after a trip to the cash machine. This prevents the seat from being taken by another player. In real life, a large percentage of the time the player never returns, despite a promise to do so. After 10 or 15 minutes the dealer will take the absent button back and the seat will be available. The less common pattern of usage is that some poker rooms instruct dealers to toss an absent button in front of a seat as soon as it is vacated. This has the advantage of helping the dealer remember not to deal cards to that spot. Its disadvantage is that this practice is confusing to people who are not accustomed to this usage of the absent button, because it actually means that the seat is available — the exact opposite of what the button means in most casinos. Sometimes an absent button will also be put out when a player has told the dealer he or she will be on an extended break, such as for dinner. The message it conveys in that situation is basically, "Yes, this player has been gone for a while, but nothing's wrong... this was expected." The "reserved" button is just a different form of the absent button. They have the same functions. One casino in Las Vegas bizarrely uses reserved buttons, but also follows the second pattern of usage just described. That means that an empty seat with a reserved button in front of it is open and available, while an empty seat without a reserved button is actually reserved — it is being held while a player goes to get more cash to buy back into the game. As you might anticipate, that confuses everybody who isn't used to the idiosyncratic rules and practices of this particular poker room. 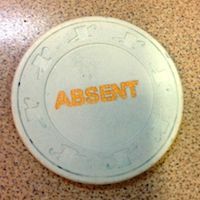 This button is placed in front of the seat of a player who was away from the table when it was his or her turn to pay the blinds. (This is not applicable in tournaments, as absent players have their blinds taken out of their stacks, anyway.) When that player returns, he or she will be given the option of paying the missed blind(s) right away, out of turn, and thus be eligible to rejoin the game, or the player can wait until the blinds come around again in natural order. Usually a player who misses one of the two blinds misses them both. But once in a while a player may miss just one of them. In that case, the dealer may pull out a variation of the missed blinds button that specifies "missed big blind" or "missed small blind." Because of space limitations on these small buttons, sometimes they just say "big blind" or "small blind," with the "missed" being implied by how it is deployed. A frequent question of players new to casino poker is whether they have to make up multiple rounds of blinds after being gone for more than one full orbit. You may remember from my article "Playing Your First Round" that it helps to think of the blinds as payment in advance for one round of poker. Once you remember that, the answer to the question becomes clear — No. Missed blinds are not paid in arrears; only one set needs to be put in when it's time to rejoin the game, as payment for one full (or partial) round. Nobody keeps track of how many times the blinds pass your seat while you are gone, because it's a completely meaningless number. 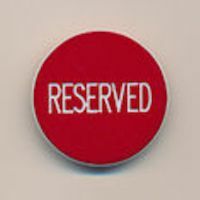 When this button is sitting in front of you, it means that you have claimed and reserved the right to move to the next seat that becomes available. To get it, just say to the dealer, "May I have a seat change button, please?" You can hold onto it as long as it takes for a seat to open up. If there is one particular place you want to move to, you can keep refusing other seats as they become vacant, and still hold on to the seat change button until the one you want is available. 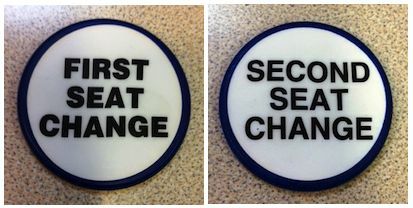 Some poker rooms have multiple prioritized buttons: "First seat change," "Second seat change," and sometimes even "Third seat change." (A knowledgeable friend tells me of one Vegas poker room that has them up to sixth seat change, though I've never seen that myself.) But two players simultaneously wanting to reserve the right to change seats is sufficiently rare that many casinos don't bother with more than one seat change button per table. It chagrins me to have to report that there still exist a few holdout casinos that do not keep seat change buttons in the dealer trays. In these places, you have to just tell the dealer that you'd like to change seats, and hope that everybody remembers and doesn't argue about that claim when the opportunity arises. A pox on the poker rooms that don't take this simple step to keep peace and order in the game! Think that's all the buttons that ever could be seen? Nope! There are still many more buttons to tell you about, so stay tuned. How Long Is the Long Run in Poker?